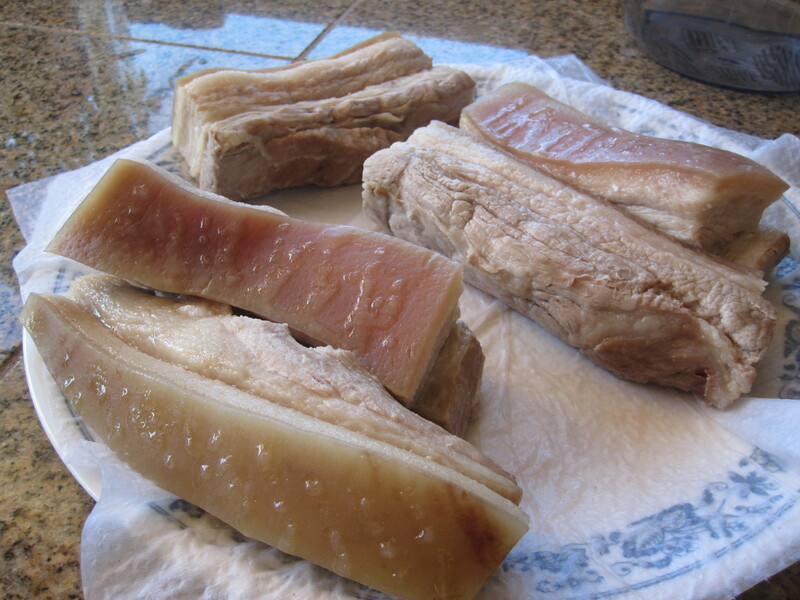 Boil pork belly in a pot over high heat, until a chopstick can poke through the skin. Remove the meat and pat dry with paper towel. Let it cool slightly, then prick the skin all over (the more the better) with a fork. Trim off taro skin, and cut into pieces (about 2 inches by 1 inch, 1/2 inch thickness). Pan fry taro pieces, until aromatic and the surface is golden brown. Set aside and marinate in half of nam yee marinade. 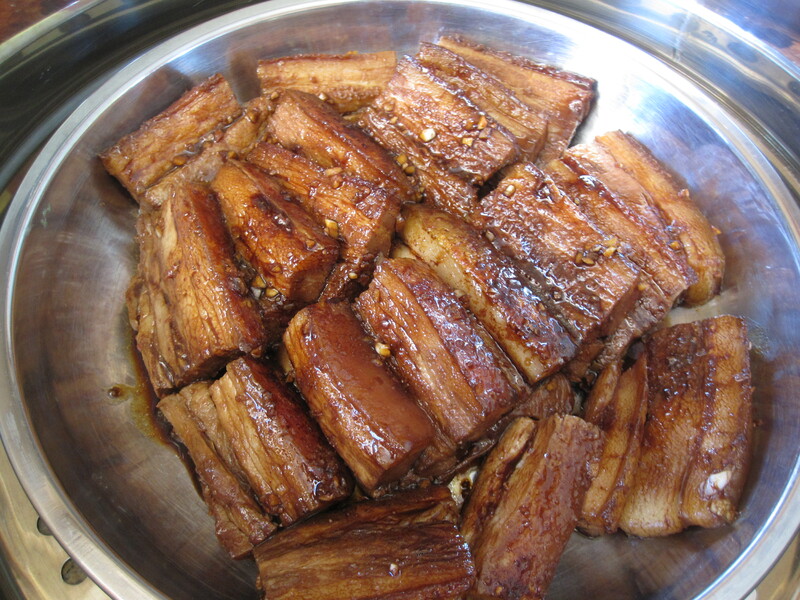 Use the same pan to fry pork belly skin (I first turn off the heat after frying taro, place pork belly skin down, add a little oil, turn heat back on medium high, and cover the pan with a lid). The purpose is to fry the skin to golden brown. During the frying process the skin will burst out oil and make lots of crackling sound, so be sure to cover the pan with a lid for safety. When the crackling sound subsides, turn off heat and wait a while before checking the skin. If the skin is still not crispy and golden brown, turn heat back on and continue the frying process with a lid. Remove pork belly from the pan. When it is cool to touch, cut the meat to about the same size as taro pieces. Marinade the meat in pork belly marinade for 30 minutes. In the meantime, prepare a steamer. Arrange pork belly pieces, skin faces up, in a deep dish plate. Drizzle pork belly marinade over the meat. Steam on high heat for 1 hour. Remove the meat from steamer, but keep steamer on high heat (add more water to steamer if necessary). 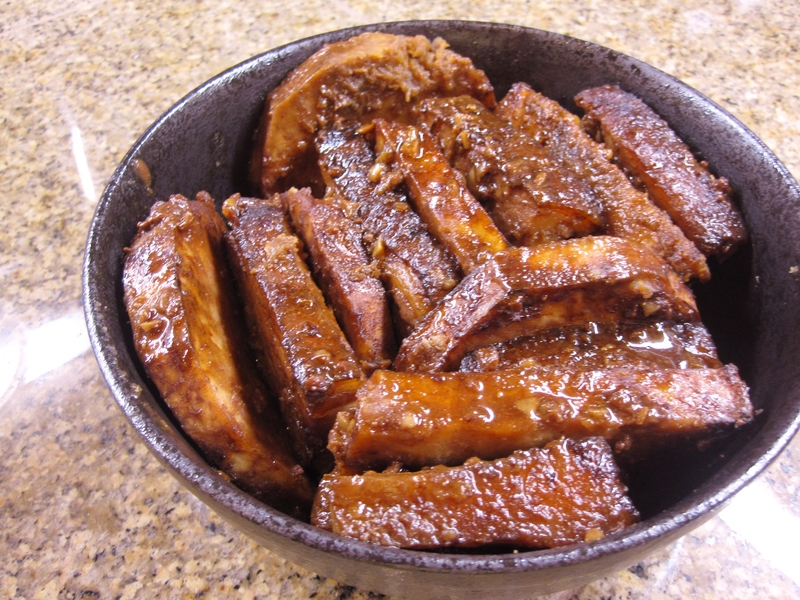 Place a piece of marinated taro between pork belly pieces, and drizzle the marinade all over. Return to the steamer and steam on high heat for another 20-30 minutes. This is my first trial and I found there’s very little sauce. I like it better if there is more sauce so I can thicken it up and drizzle back onto the dish (it’s good with the rice!). Next time I should make more marinade or add some water to it before steaming. 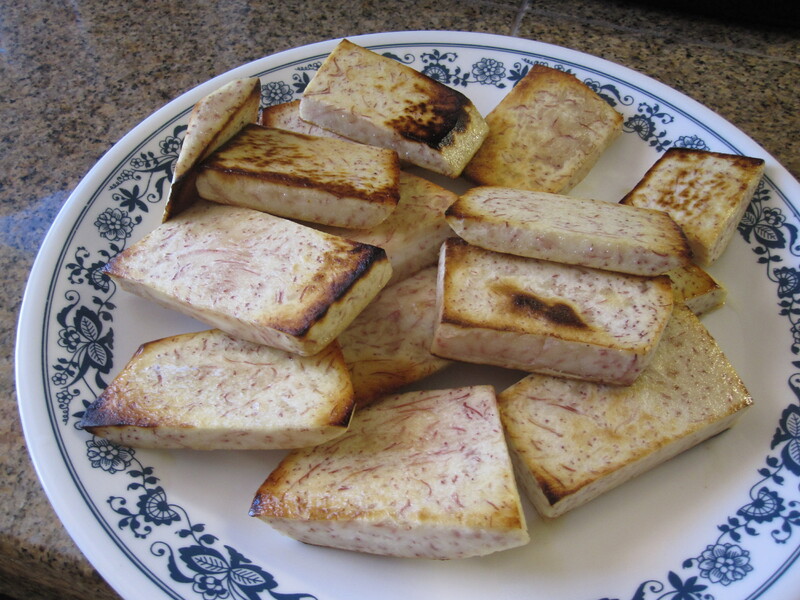 Taro pieces after pan frying. 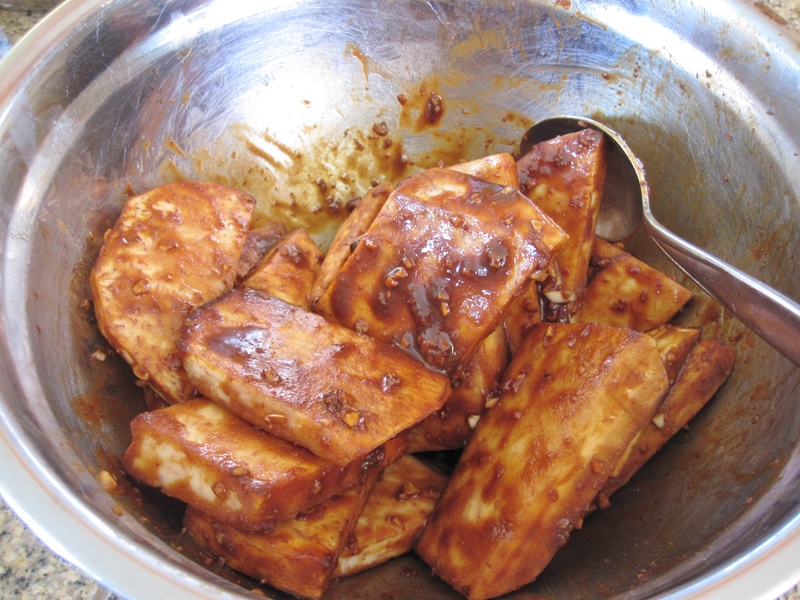 Marinate taro pieces in nam yee marinade. Pork belly-- after pricking the skin and before browning the skin. Steam pork belly pieces before adding taro pieces.